Quoizel Lighting has light fixture options for any outdoor situation. To light up your garden and driveway, your lawn and porch area, Quoizel outdoor post lights are the best lighting solution. From cozy cottage to gatehouse transitional styles, these outdoor post lights feature craftsman, Victorian, Tudor, Gothic and contemporary lighting designs. 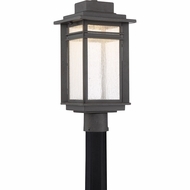 Available finishes include old English, aged copper, and imperial bronze, and these designer outdoor light fixtures are weatherproof in almost any climate. Many of Quoizel Lighting's outdoor post lamps even come in energy-saving fluorescent and LED models, so you can conserve energy and brighten up your yard or pool area at the same time.